I probably overuse the word sweet on this blog, but when you are talking about kid's books, that is the word that most freely pops to mind on titles like this one. Illustrated by the naturalist painter currently known as Joan Berg Victor and written by the kid-lit goddess herself, Flocks of Birds is a weeper for parents remembering or cherishing those bedtime moments when anything is possible as long as mommy says it's so. Those little made-up tales that parents weave when the lights are out to send their babies minds off wandering to dreamland. and her mother had kissed her good night. "But I'm not sleepy," the little girl said. "and think your thoughts until you are." "Give me something good to think about,"
the little girl said, holding her mother's hand. "Think of flocks of birds," her mother said. "Close your eyes and think of flocks of birds flying south." I try and be like this at bedtime... soft stories whispered of winged angels and ancient fables passed down from my mother to me to my son... but my husband has taken to singing him The Beverly Hillbillies theme song when the lights go out, and wondrous stories of flocks and fairies often get squeezed out by Jed and all his kin. Oh well. I can see my future. "Well son, did I ever tell you the story of how your father and I moved from New York to Texas? You see, green acres is the place for your dad and me. Farm living is the life for us. Land spreading out so far and wide. We told all those yankees they could keep Manhattan, and just give us that countryside." 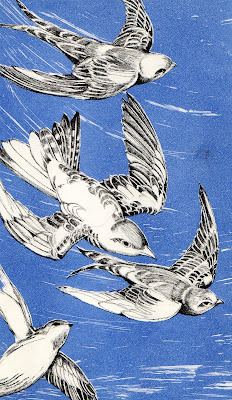 The imagery is just beautiful -- I still like to fall asleep with these same thoughts of birds soaring through the sky and being in the country. he he...bedtimes can be a bit of a challenge for us.My hubby thinks pirate games and songs are great for settling little girls :/ That book sounds adorable. Bedtime is the best time... even if it does get a little hillbilly.